Did you enjoy playing Ben 10 Fighting Games till now? If your answer is yes, then you have a reason to celebrate. We are adding another interesting game – Ben 10 Diamondhead Shoot. The Game is very similar to the Ben 10 Wildvine Shoot where your only objective is to kill the flying robots coming towards you. Recommended: Play Ben 10 Wildvine Shoot game online for Free now. Ben 10 Diamondhead Shoot is a single player game in which you have to shoot the enemy robots flying towards you from all the directions. This is a timer-based game in which you have to shoot the maximum number of skulls approaching you. Your Score will be based on the number of Skulls you Shot. The more you kill the enemy skills, the more star rating you get at the end of every level. As you approach towards the High levels, the enemy skills will get faster and huge in numbers. Pro tip: Try not to miss your target in the first go and kill all the enemy robots. Now, it’s the time to Save the World from the Skull Robots and our only hero Diamondhead can do it. Get your weapons Ready! 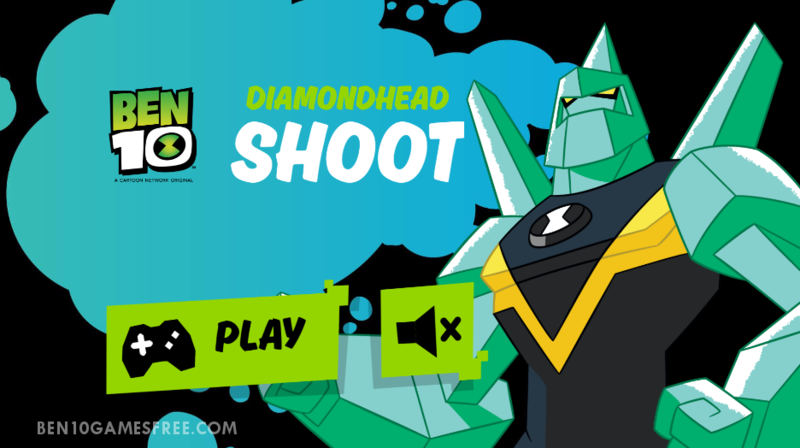 Don’t Forget to give your rating for Ben 10 Diamondhead Shoot game and share your tips and tricks to win this game in the comments section below.